Wandering Shadow: Batla House encounter, just an election recipe? For political commentators, a swift Congress strategy to lure the minority in the Uttar Pradesh elections was visible. While the comment may have been emotive for a significant part of the minority community, it raises the larger question of political discourse in India, where secularism merely has been glued to the paper of the Constitution. On September 19, 2008, in an encounter at Batla House, Jamia Nagar, Delhi, senior inspector Mohan Chand Sharma and two suspected Indian Mujahideen terrorists, Atif Amin and Mohamed Sajid, were killed while two other suspects Mohd Saif and Zeeshan were arrested. Another accused Ariz Khan managed to flee. Sharma, who was awarded the Ashok Chakra later, had played a crucial role in cracking the Parliament attack case. Home Minister P Chidambaram, saying there was no scope of reopening the case, called the encounter ‘genuine.’ If the Congress is keen to address the grievances of the Jamia Teachers’ Solidarity Association and other political outfits who’ve raised doubts over the encounter, why doesn’t the party bring consensus among their own leaders? Or, is the issue a deliberate attempt to cultivate an election recipe to milk the minority vote? 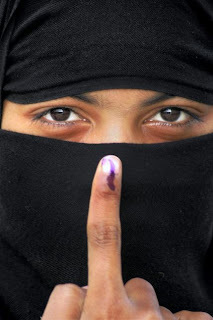 Muslims too are human, not to be singled out as a vote bank. The Congress strategy in Uttar Pradesh has suggested a broader framework to ‘living in denial’. The party is following in the footsteps of the Samajwadi Party’s formula of minting votes through minority appeasement. It was seen when Khurshid announced a sub-quota for the minorities in Uttar Pradesh, demolishing the Election Commission code of conduct. Will we remain entangled in this cynical web of politics? The political class — both ruling and the opposition — needs to introspect on the techniques being adopted in the system. There is certainly more to elections than winning votes. Reservations as a policy for uplifting the backward sections haven’t been effective. Prof Purushottam Agrawal of the Jawaharlal Nehru University in 2006 presented the Multiple Index Related Affirmative Action as opposed to the reservation policy. While several academicians have supported the idea, the HRD ministry has remained ignorant till date. Congress leader Shashi Tharoor, who recently aired his support to the MIRAA framework on Twitter, may bring hope for the beginning of a solution. In India, politics has to be rescued from the clutches of the skull cap and tilak. Religion has its sanctity, which should not be mixed with politics. The implicit non-secular planks in the name of secularism only go on to demonise democracy. The writer is the India Editor of The Indian monthly published from Sydney, Australia.